It’s time to take over your students’ union! Nominations for the 2014 elections open today, with over 70 places up for grabs as the time comes to take over your students’ union! This year, we’ve made it even easier to get involved, as you no longer need students as supporters on your application. 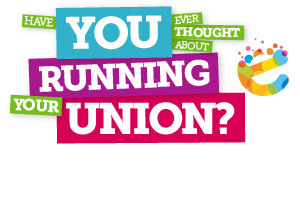 If you think you might be interested but want to find out more before jumping in, you can come along to the concourse between 12 and 3pm on Friday and chat to Union President David Gilani about what’s involved. If you’re interested, you’ve got until 12pm on Monday 17th February, when nominations will close. This year there are seven full-time (sabbatical) positions, and 63 part-time positions – Student Leaders, student trustees and Union Councillors – you can find out more about the positions here. “As President you could be in charge of an organisation with over 400 staff, a multi-million pound turnover, and helping make students’ lives better on a daily basis. Voting takes place between Monday 24 and Friday 28 February (week 22) and the results will be announced on the 28th at a special Results Night ceremony, starting at 8pm in the Cube. If you have any questions or queries, please don’t hesitate to get in touch via democracy@susu.org.